Mayor de Magistris: Naples and San Francisco United for LGBT Rights. Press	No Comments on Mayor de Magistris: Naples and San Francisco United for LGBT Rights. 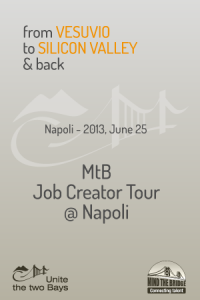 2013, jun 25: A bridge for Startups..
Naples – June 25, 2013 – Everything is ready for the competition between innovative ideas “From Vesuvio to Silicon Valley … and back again”, sponsored by California based consulting firm Campania Felix, LLC. and Napoli based non-profit Association Skillpoint, which will be held June 25 in Naples at the PICO (Palace of Innovation and Knowledge). Press	No Comments on 2013, jun 25: A bridge for Startups.. I hope this email finds all of you well. I apologize for intruding into your work day but I wanted to alert you of an event that you may find interesting. On June 14 at 11:30 AM the Mayor of Naples (Italy) Luigi de Magistris will be meeting the press at the Commonwealth Club of San Francisco to discuss the new spirit of resurgence that is enlivening this southern Italian city.